Stay long enough in Krakow and you’ll probably be itching to get out and explore. We don’t blame you. Above all Poland is a beautiful country and well worth exploring. Better yet, do it on a bike and you’ll get to see more in less time. And have a lot of fun as well. Here are some ideas for biking day trips outside Krakow. Of course, if you prefer to keep your feet firmly on the ground you can take public transport to all these places. Why not go and see some nature at the Ojcow National Park. Actually it’s relatively small size, which at 21.5 sq. 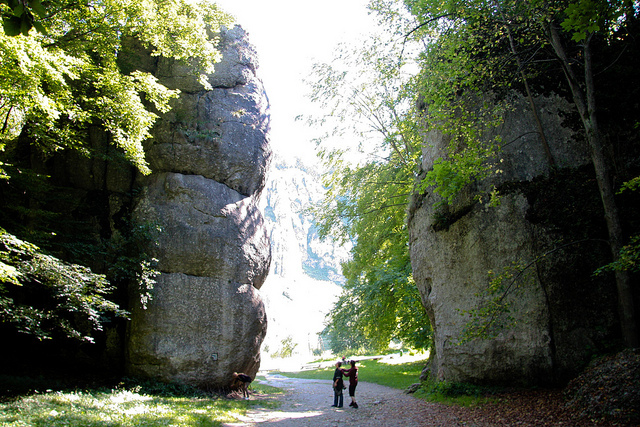 kilometers, makes it the smallest of the 20-odd National Parks in Poland. And while the wildlife is stunning, it’s the limestone rocks, some as high as fifty meters, that really draws the crowd. Also there are natural caves for you to explore. As a result of being just 24 km away from Krakow, it makes for a good biking day out. Poland’s Eagle Nest Castles are rather stunning buildings that sit on the hilltops along the Krakow-Czestochowa Upland. King Casimir III the Great oversaw their construction, and over time, after some renovation, they still retain their original look. Presently the whole trail runs 164km – through Ojcow, Pieskowa Skala, Rabsztyn, Klucze, Bydlin, Smolen, Pilica, Ogrodzieniec castle, Gora Zborow, Mirow castle, Potok Zloty, and Olsztyn. Though you can decide how far you go out as it would be impossible to see them all in a day. The two nearest ones are next to Ojcow National Park. At 42km southwest of Krakow, the Calvary Sanctuary in Kalwaria Zebrzydowska is a worthwhile day trip for the fit cyclist. Kalwaria Zebrzydowska is a town in the charming Carpathian Foothills. There are 42 churches of all different shapes and sizes. And all equally magnificent to look at. This sanctuary is now a UNESCO World Heritage site. It is, and has always been, an important site for pilgrims. Because of this, today it’s a great place to meet and mix with people from all over Europe and the world. 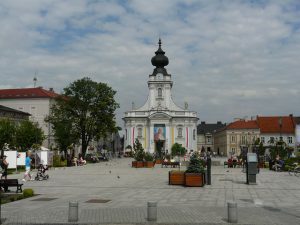 Wadowice is a small city of about 20,000. But most importantly, it’s the birthplace of the much revered Pope John II who was born there in 1920. 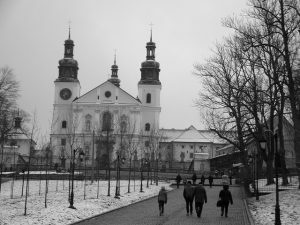 The city is located southwest of Krakow, not too far from Kalwaria Zebrzydowska. Almost all visitors first head to No. 7 Koscielna Street which is where the Pope grew up. Consequently today the museum is a dedication to his life where you can see pieces of his furniture and belongings. Furthermore you can also see the church he said prayers nearby. It’s a heavy mix of 15th century Gothic architecture and late 17th century Baroque. Finally, once inside, you can see the font where the Pope was baptized.